Let Hit Songwriters show you the simplest ways to get started in songwriting. Discover How to Write Songs & Lyrics for Recording Artists ... How to Get a Manager to Pitch Your Songs ... How to Earn Royalties ... and more! 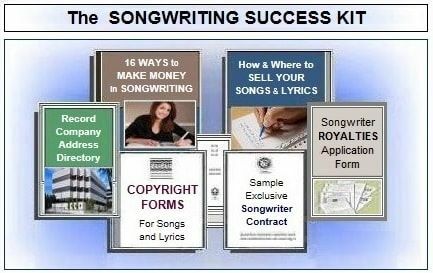 The complete, step-by-step guide to selling your original songs and lyrics provides you with everything you need to cash-in on your songwriting talent. Almost half of today's Recording Artists don't write all of their own songs, and Record Companies, Music Publishers and Managers are always looking for new original material for their Artists that don't write songs. Almost half of today's top Recording Artists don't write all of their own songs, and rely on songwriters and lyric-writers like you for a constant flow of new, original songs and lyrics to record. The Songwriter's #1 Resource! 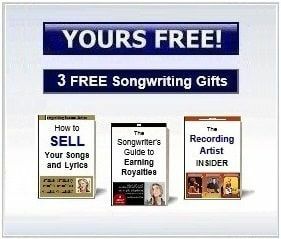 Everything you need in one kit, to start earning money as a songwriter or lyric-writer.